Early before the coalescence of the frenzy, we had started to form our family values. One of our now well-established family values is that we try to minimize harm caused by what we buy. We don't always succeed but there is one thing we avoided from the very beginning because of the incredible damage it has done around the globe. Buying a diamond ring. This was particularly my hang up perhaps caused by Leonardo DiCaprio's attempt at a South African accent. I would not spend money on a diamond ring. But I also didn't want to seem cheap to my soon to be bride, which was entirely in my head and had nothing to do with what she thought of me. So I started the delicate dance of figuring out if we were in the 100 percent getting married camp while bringing up my ethical dilemma. Luckily, I was not left wanting for clues on this one. It was made very clear that we were indeed in camp and that we should get started on pitching the tent before midnight. I got lucky because we quickly figured out we were on the same page about diamonds, then my posturing to make sure it was obvious that this wasn't about money began. We found a local artisan who had a portfolio of rings that we liked. I had no idea what it would cost to get the rings so I sent an email basically saying "I don't know if you work for this amount of money but here is what we want to spend on rings..." He said it would work. Pricing here was very murky, but since there was no negotiation, I'm sure my figure wasn't the lowest amount of money he had worked for. He also helped us locate a stone that had been pulled out of the ground by a local hobby miner. We know where the stone came from because it's found in a limited area. It wasn't repackaged as an "ethical" stone, nor was it a stone that people would put a high demand on. You could find something similar at a rock show laying out on a folding table with an old rock hound vaguely watching over it. He gave us an excellent experience and we got custom rings that spoke to us. So in the end, I might cringe a little at the idea we may have overspent, but I'm happy with the result. The interesting thing about buying a ring without a diamond is how few people it impressed. Had we spent the same amount of money on a diamond solitaire, it would have been ungainly at a carat and a half or so for a "reasonable" quality diamond. (To be fair that's a guess from looking online and vaguely adjusting for inflation and no I'm not going to link to an online diamond site.) Everyone would've made the obligatory gasping noise acknowledging what we spent and comparing it to their wedding rings. But we broke that cycle. They had no idea, so they just looked at the ring and said "Oh that's nice". For the most part, we never filled them in. We find it amusing when someone implies we were cheap about our rings. Still that comparison is part of the problem. We (mostly) don't care, but others do. I'll admit to being annoyed on rare occasions. Just not annoyed enough to be the kind of person who brags about how much they cost. Nor am I going to put the amount in this post to get criticized from both sides saying we spent too much or too little. The ability to compare rings shows your status relative to others with cheaper rings. So either people assume we have a low status (couldn't even get a diamond ring) or they cannot place us. Some people may prefer diamond rings even if that wasn't a social expectation. However, there is no way to extract that population from those of us who have been marketed to for ages. The main value of a diamond ring is we all know how much a diamond ring should cost. It's about the same as buying an expensive Mercedes that you pull out of the garage when you're home so it isn't hidden from the neighbors. Diamond rings are not just a marketing con job. They are a leach on our society. For those who produce them, the conditions can be inhumane. But it also is a millstone around the neck for those who purchase them. A diamond ring takes money from a big portion of our society right when they are combining finances and setting up a household. There are many higher and better uses for that money. But De Beers has figured out a way to extract money from everyone, both the rich and the poor. If you have money and put an impressive diamond on your fiance's finger, you are complicit with De Beers. You help set the expectations for weddings in our society. I could care less if De Beers disappeared tomorrow. @#$%$ De Beers. I feel the same about all diamond retailers, it's just easier to throw stones at the biggest wolf in the pack. Our society has embraced this mass illusion that we need diamond rings when we get married. This has real consequences for both our society and others. The worst part is that diamond rings provides no intrinsic value. We have issues with waste streams for things like batteries and milk cartons that provide a useful service. But diamond rings do nothing useful. Seriously, if you want to show how much money you have, we'd all be better off if you just made a dress out of $100 bills and wore it around. I suppose there would eventually be consequences from that as well. A diamond ring is not the only burden the rich push onto the poor. We've turned "keeping up with the Jones" into a phrase that puts the burden of guilt on those who attempt such a feat. But don't the Jones hold some responsibility for setting the expectation in the first place? 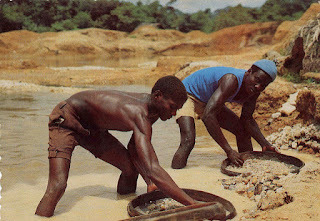 Buying a conflict free-diamond perpetuates the social expectation. It contributes to the entire market for diamonds. Sure you know that the stone you're wearing wasn't dug out of the ground by a child, but wearing any diamond makes the stones that are dug out of the ground by children more valuable. Because we've setup this expectation, there will always be those trying to stretch the money they have as far as possible. They won't do online research to source the diamonds ethically. They will be looking for a good deal. And since at the end of the day when 99.99% of us look at a ring we have no idea where the diamond came from, it won't matter that yours is from Canada. Want to help the Canadians? Buy maple syrup, it's delicious. Every diamond ring contributes to conflict. Even a cubic zirconia ring contributes to conflict because it looks like a diamond. Why is wearing a diamond necklace acceptable but wearing fur as a fashion statement passé? I won't buy diamonds or anything that looks like them. I don't think they should be worn. And yes, I will judge those who do wear them. But in my everyday life, I'm not going to be the person who tells someone who just bought a diamond ring how terrible that decision was. However, it's on this generation and the next to flip the narrative. I someone shows me a diamond ring, I'll take the same attitude that people gave us when they looked at our rings. "Oh that's nice..." But if someone shows me a ring that doesn't have a diamond, I'm going to make a big deal out of it. I'm going to be very impressed. I'm going to tell them how cool they're engagement ring is and how it's way better than any diamond solitaire I've ever seen. I'm going to be loud and hope that everyone around us overhears how impressed I am. I'm also going to tell my kids that we didn't buy diamond rings because they cause more harm than good in this world and that I hope they don't buy or wear them when they get older. There may be some times where you cannot avoid getting a diamond and you should be graceful when getting gifts, but with something as serious as marriage, it should be clear way ahead of any engagement that a diamond ring is off the table. And when you do get gifts, maybe wear it once around the person that gave the gift. After that stick it in a closet, don't resell it, don't wear it, do your best to subtly discourage future gifts with diamonds. @#$%$ De Beers. Honestly, when getting married there are plenty of things to do with money. Pay off debt if you have it. Go on a better honeymoon, or go on a cheap honeymoon and plan an exotic vacation a year or so into the marriage when you'll enjoy the location more. Put it into a down payment on a house. Or save it for retirement. Whatever you decide to do with the money, it's easy to find something more productive than buying diamond ring. Honestly, I like my ring, but if we had it to do all over again, we would've spent the money on travel as a couple with limited frenzy (a.k.a no kids). I know it's awkward to talk about a diamond ring before asking someone to marry you. Part of the amazing con that the diamond industry has pulled on our society is this expectation that the ring has to be present for the engagement. It puts the pressure on the person going down on the knee to have something very impressive in a little box. After all, if the ring isn't impressive then they may say "no" based solely on the ring... Which of course would be a very good sign that you just dodged a bullet, but love isn't rational. Still try to have the conversation in advance. Talk about exotic vacations or just luxurious ones and how they just happen to cost the same amount of money as a diamond ring. Reference the Citibank commercial where the girl wants to climb a rock rather than buy a ring in casual conversation. (Then if you thought that was scary watch what it looks like when the guy in the commercial climbs without a rope.) There are ways to approach the conversation without saying "Will you marry me without me having to buy you a diamond ring?" But if that's all you can come up with she should probably get used to the lack of tact now. Seriously, whatever it takes. This is something that needs to change in our society. A minuscule sliver of our society benefits from diamonds. Your local jewelry store would still exist without diamond engagement rings. They may need to be a bit more creative in what they sell. Make something that looks more like art and less like a commodity. If you don't sound impressed enough the next time someone points their wrist at the sky while holding their engagement ring out for your to see, feel free to blame me. Better yet, when your friend starts talking about getting married, talk about it. Ask them "What are you going to do about the diamond ring problem?" And when they ask what problem, feel free to send them to me. They can yell at me in the comments, but I may suspect they are undercover for De Beers, and @#$%$ De Beers.